Born i n postwar Germany into a family of refugees from the Soviet Union, Marina Antropow Cramer has enjoyed the benefit of lifelong ties to the Russian expatriate community on both sides of the Atlantic. She holds a BA degree in English from Upsala College in East Orange, NJ. Her work has been performed by Roselee Blooston’s Short Story Theater, as part of the non-profit Tunnel Vision Writers’ Project, which showcased spoken word, music, and visual art projects. A short story, “Pear,” appeared online in Blackbird Literary Journal in 2009; another story, “Grave,” came out in the Fall 2009 online issue of Istanbul Literary Review. The digital journal Wilderness House Literary Review published “In Case of Fire” in the Winter 2010 issue, and “Half the Bed” in Winter 2012. 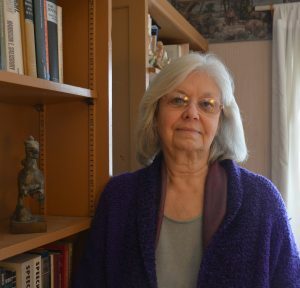 Between 1985 and 2002, Marina Antropow Cramer owned and operated The Cup and Chaucer Bookstore in Montclair, NJ. When its doors closed, she worked for Watchung booksellers, a fellow bookseller in the same town, for the next twelve years. Among her favorite duties while there was leading a writing workshop for kids and compiling an annual litmag of their work. Together with author Jenny Milchman, she facilitated Writing Matters: A Dialog on the Craft and Business of Words. A series of bi-monthly panel discussions that ran at the book shop from 2009 to 2012, Writing Matters featured conversations with publishing industry professionals, as well as writers, translators, illustrators, playwrights, and poets. She left bookselling in 2014 to focus on writing full-time, and now lives in New York’s Hudson Valley. Roads is her first novel.